Second chances don't come along that often - but this week in 1990, several songs were given another opportunity to become hits on the ARIA singles chart. As we'll see, only some of them did any better. The second chances came in a variety of ways - from reissues of previous singles to cover versions of songs that hadn't been hits for the original acts to a couple of releases by the same artist that were given a simultaneous boost up the chart. At the number 1 spot on the top 50 this week in 1990 - The B-52's held off yet another single as Black Box's "Ride On Time" became the latest track stuck at number 2 behind "Love Shack" (following "I Feel The Earth Move" and "I Want That Man"). It originally made number 46 in 1987, but surely after their more recent success with the Hysteria album, "Animal" would be a bigger hit now, right? Wrong. In the US, this had been Paula's second single in late 1988 (after "Knocked Out") and made number 88. A re-release took it all the way to number 3 there. In Australia, where I'm not sure if it had ever been released previously, it didn't fare so well. Not a re-release, but a remake - of Stephanie Mills' debut US hit from 1979. Unsurprisingly, it was another Inner City single to miss the top 50 here but the cover was the house duo's fifth UK top 20 hit. This is pretty much the only song I can't squeeze into my second chances theme this week - and believe me, I tried to think of a way. 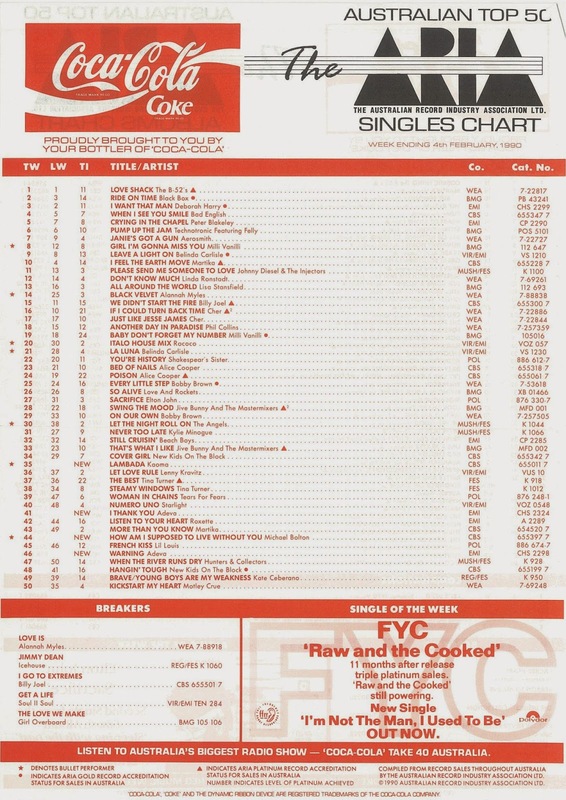 Despite the promotion it received on this week's chart, the fourth single from The Raw & The Cooked (fifth, if you include "Ever Fallen In Love") became the album's first to miss the top 100 entirely. Easily the weakest single so far, "I'm Not The Man I Used To Be" should perhaps have been left as an album track. The first time this song was released in Australia, it had only reached number 46 for Laura Branigan. 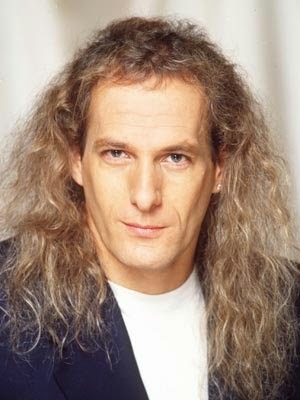 Six-and-a-half years later, Michael Bolton decided to record his own version of the ballad, giving it the full heart-wrenching treatment and watching it soar all the way to number 2. It was Michael's second cover version to make a splash on the ARIA chart - he reached number 3 in 1988 with an update of "(Sittin' On) The Dock Of The Bay" - but the difference this time was that he had actually co-written "How Am I Supposed..." during his pre-fame years as a songwriter for hire. Michael's version of the song topped the US chart but had to make do with the runners-up spot here, where it was stuck for four weeks behind another remake we'll see debut on the chart in two weeks. Here she is again - the singer born Patricia Daniels who found success in the UK thanks to a string of club and chart hits that had started with a remarkable remake of "Respect". Interestingly, "Respect", "Warning!" and "I Thank You" all peaked at number 17 in the UK - while in Australia, the number 30 placement of "I Thank You" was as good as it got for Adeva. Like Inner City, Adeva couldn't sustain her initial burst of success in the UK and despite releasing some excellent tracks throughout the rest of the decade (including collaborations with Frankie Knuckles and Hyper Go Go), she mostly went under the radar. She made one more appearance on the ARIA top 50, though, which we'll see when we reach 1991. I might be stretching things here, but since world music hit "Lambada" was actually a cover version, it also fits this week's second chance theme. Although, unlike the original releases and versions of the singles we've seen so far, I don't think the songs "Lambada" is based on would ever have been in contention to hit the ARIA chart. Songs plural? Yes, "Lambada" has a complicated backstory, since the Kaoma single incorporates elements from a 1981 Bolivian folk tune, a 1984 dance version of that tune (which was the first to feature the accordion riff) and a 1986 track which included a Portuguese translation of the lyrics. What's more, Kaoma used some of those elements without permission. Naturally, since "Lambada" was a multimillion-selling global smash hit that spawned a brief dance craze and even two rival movies, legal action ensued. There were no second chances as far as Kaoma's career was concerned and the group became the first one-hit wonder of the '90s on the Australian chart since follow-up "Dançando Lambada" sank without a trace. Next week: a massive debut from one of Australia's biggest bands, plus two singers from the '70s kick on into the '90s. I remember this chart vividly, as it was another week where my VCR timer failed (or I didn't set it properly) to record the top 50 on rage, so initially I missed the first 15 or so songs. However, on the Friday afternoon of the following week, I took a detour past the small independent record store near my school on the way home, to see if they had the printed chart. To my surprise, they did (this was the store where they still had copies of the first ARIA chart I picked up several weeks after its publication date). I couldn't believe that both Adeva songs had debuted on the week my recording stuffed up, as I'd wanted to record the videos off rage for several weeks, and thought their chance at entering the top 50 had probably passed/was slim. I was gutted the following week when one of the two had fallen out of the top 50. The 'Warning!' cassingle was my first music purchase of the 90's, and I bought the 'I Thank You' one a week later. 'Warning!' also appeared on the ‘Hits of 1990 Volume 1’ compilation, released late in 1989, making it even more surprising that the single would enter the top 50 this late in its chart life. Eurythmics were another act whose first 2 singles debuted in the top 50 during the same week. It's a shame those singles that 'Love Shack' held off #1 didn't topple it, as they were probably more worthy. Paula had so many flops here off the 'Forever Your Girl' album; I'm surprised the local branch of her record company were still bothering to release singles from it. It was good knowing over half of the album though when I finally picked it up. I don't think I was aware of the Inner City track at the time, but got hold of the video several years ago. It's good, but not as immediate as the previous singles from 'Paradise'. Good to see the Fine Young Cannibals chart position here; I wanted to ask ARIA about that one. I still think they should've gone with 'I'm Not Satisfied' as the third (or even second... both excluding 'Ever Fallen In Love') single from 'The Raw & The Cooked'. I've seen on a UK video compilations that the father slapping his daughter after catching her doing the Lambada with a boy scene was edited out of the 'Lambada' video; yet it aired here during the G time slot. Was the UK more 'conservative' than us with this sort of thing at the time? I remember one music magazine famously describing female dance singer Adeva as "having fought a losing battle with anonymity"!! Her 3 or 4 minor hits in 1989-90 were the sum total of her chart appearances, with I Thank You being at least okay. The Kaoma song Lambada went with a Latin dance craze that swept the world in 1990. Unfortunately its singer: Loalwa Braz of Brazil, recently died in January 2017 when falling victim to crime.